The other day I took a quick peek at some of my early blog posts...waaaaay back in 2011 when I first started this little ol' thing. I was trying to remember why I started this blog, and as I stumbled through some embarrassingly weird, awkward, rambly posts (as mine often tend to be), I remembered that I started it for myself. This was back before social media was what it is today- basically the ruler of our modern lives. Back when I started this blog, blogging was the way to connect with other people, to share your life with your family and friends, and to keep a sort of record of your daily or weekly happenings. I started it because I liked to write, even though I'm not the best at it. I'm not some eloquent speaker, nor do I come across that way in print, but I've always loved journaling and writing my thoughts and ideas down...even if it's just for myself. Most of my stuff ends up being way too long or wordy, but that's me- I'm the friend who sends you a wall of text on Facebook messenger or in a text message. Nevertheless, my point with that already too-long introduction paragraph, is that while browsing through some of my archives, I realized how different I was back then. That while this little blog URL might still be the same, the person writing it isn't. When I shared my very first blog post I was a 20-something stay at home mom with two little kids. I was bored and lonely. My two kids were the easiest, sweetest, super low-maintenance, most self-sufficient kids on the planet, and I was living in a new town with no friends or family close by. I needed something for myself. So I started this as a hobby, to keep track of things, share my latest crafts and projects (back when I still had time for that sort of thing), and to occasionally get a little too personal and ramble my way through whatever little "thing" I was going through or dealing with at the moment. All of that seems like a lifetime ago, and the person I was back then feels like a completely different version of myself. Since it's been a whopping 6 years and counting since my first little introduction, I felt like maybe I should introduce myself now. The old me probably wouldn't recognize the me that I see in the mirror now, and that's something I've been struggling with lately. 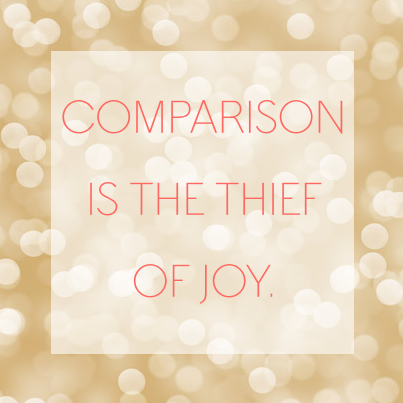 Have you ever heard the phrase "Comparison is the thief of joy?" It's so relevant for me. Not because I'm comparing myself to other people (which I totally do too), but because I'm comparing myself to the person I used to be. That young, naive, overly-eager girl has been replaced by an older, slightly wiser, way more tired, busy mom of four just trying her damnedest to take care of her family, keep the love alive in her marriage, and raise kids who grow up to not be assholes. Sometimes I get so wrapped up in what I'm not anymore that I fail to see what I am.